Mother’s day is coming. What are you going to give? I almost forgot. When is mother’s Day? Look! May 12th, next Sunday, is Mother’s Day. What are you going to send? Mom doesn’t need anything so it’s really hard to decide..
How about cosmetics? I heard cosmetics and jewelry are ladies favorites. Who said so? My mom never wears make-up nor jewelry. Mom has always loved plants, and I’ll buy her a plant. What are you going to give your mom? 有了！ 我要送機票給我的媽媽， 請她到臺灣來旅行。Right! I‘ll send a plane ticket to my mom, and invite her to Taiwan. Sounds great! You’re really sweet. Let’s check up the calendar to see which date is Mother’s Day this year. May fourteenth is Mother’s Day this year. Mom has everything. It’s really difficult to make a decision. Mom has always loved __________________. Let’s buy her _______________. 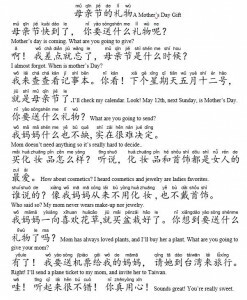 我們來查查月曆看今年的母親節是五月幾號.Let’s check up the calendar to see which date is Mother’s Day this year. 下個星期天五月十號就是母親節了.It falls on May 10th. That’s Next Sunday. 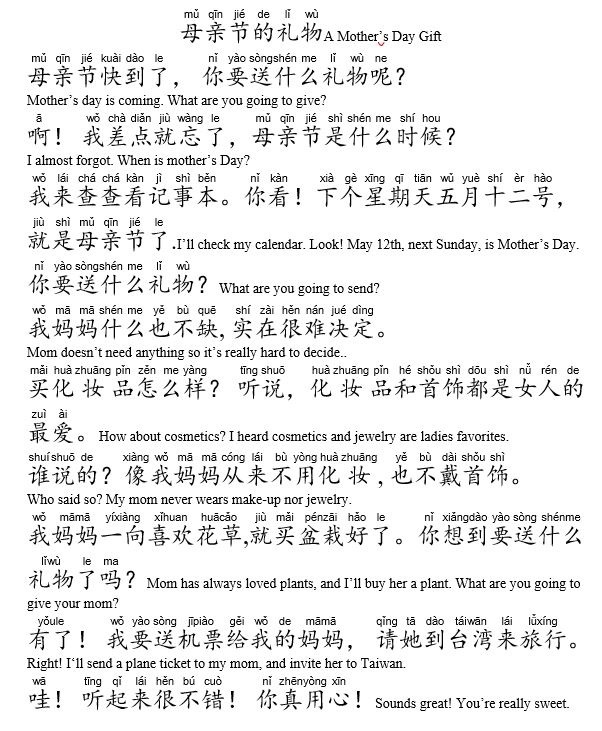 咱們商量一下,看要送什麼禮物比較好.Let’s discuss what to give to mom. 媽媽樣樣不缺, 實在很難決定.Mom Has everything. It’s really difficult to make a decision. 化妝品和首飾都是女人的最愛.Cosmetics and jewelry are ladies favorites. 媽從不用化妝, 也不戴首飾,這些好像都不合適.Mom never wears make-up nor jewelry. I don’t think these kinds of things would be right. 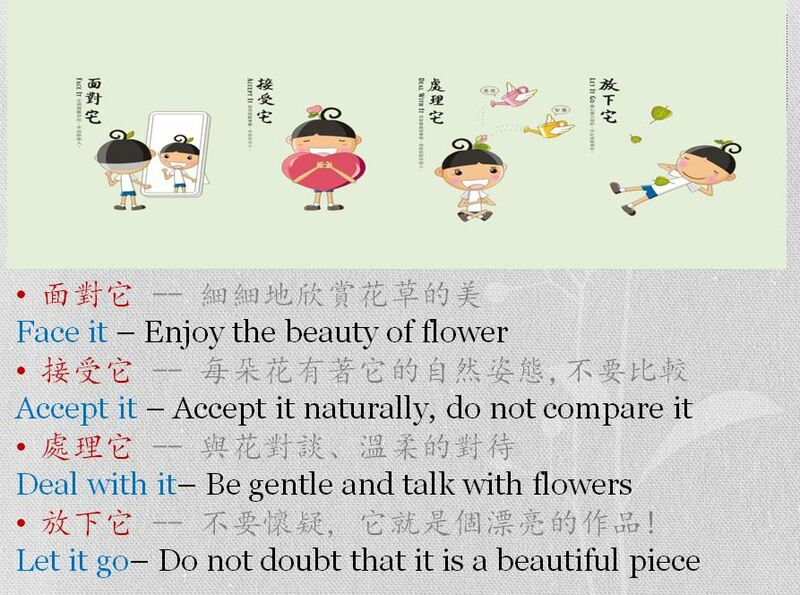 盆栽呢, 像長春藤之類的, 怎麼樣?Let’s buy a plant like ivy or something like that. What do you think? 好主意,媽一向喜歡花草,就買盆栽好了.Mom has always loved plants. Let’s buy her a plant. 適逢中秋和重陽節,至主流學校及中文學校介紹華語正體字藝術，以全球華文網的精選影片，介紹節慶背景及書法的淵源，課間古詩朗誦，體會音韻之美，本活動將書法的演變與生活藝術節合，將相關正體字教學生用毛筆寫在宣紙上, 再將宣紙裱到小卡, 繫上絲帶) (例如: “花”字, 或是“ 華”，讓學生及家長,來賓體會正體字之美)；運用具東方風味的印花色紙及紙雕蝴蝶作為花器的包裝。遠從加州來授課的插花老師: 王淑青, 運用新鮮花材及特別的華語教學內容,讓學生受益匪淺! Mister, what style would you like to see? I’ll show you. I would like to see that more formal clothes. This style’s color and material are the most popular this year. I would also like to see a hat? How about this one? Most of our customers like it. It suits you. It looks very nice. May I try it on? Of course. Please come with me. Thank you. I’ll try on this cloth and hat. You look very noble! Elegant! I think the clothe is too big! Will not, you will grow up! I think the hat is too small!